Tarragon (Artemisia dracunculus) is a species o perennial yerb in the faimily Asteraceae. ↑ Artemisia dracunculus was described in Linnaeus's Species Plantarum 2:849. 1753. GRIN (June 20, 2008). 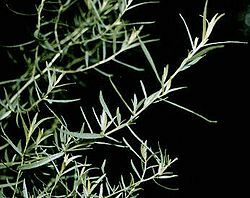 "Artemisia dracunculus information from NPGS/GRIN". Taxonomy for Plants.